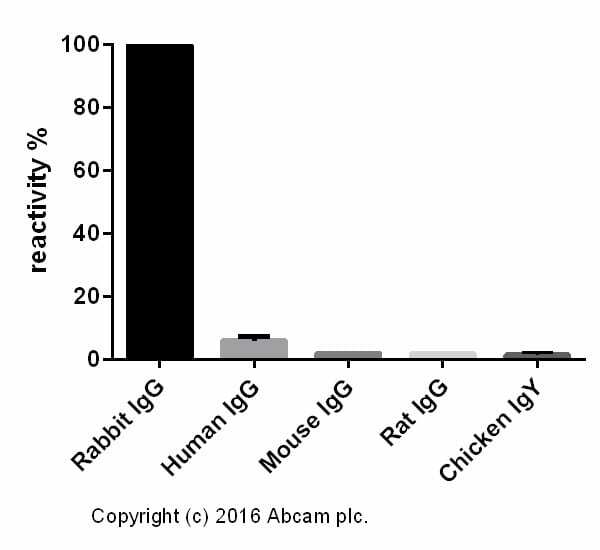 Other Immunogen Type corresponding to Rabbit IgG. Our Abpromise guarantee covers the use of ab150080 in the following tested applications. ICC/IF image of ab6046 stained HeLa cells. The cells were 4% formaldehyde fixed (10 min), permeabilized with 0.1% Triton X-100 for 5 minutes and then incubated in 1%BSA / 10% normal donkey serum / 0.3M glycine in 0.1% PBS-Tween for 1h to block non-specific protein-protein interactions. The cells were then incubated with the primary antibody (ab6046, 5µg/ml) overnight at +4°C. The secondary antibody (orange) was ab150080 Alexa Fluor® 4594 goat anti-rabbir IgG (H+L) used at 2µg/ml for 1h.DAPI was used to stain the cell nuclei (blue) at a concentration of 1.43µM. Overlay histogram showing Jurkat cells stained with ab40763 (red line). The cells were fixed with 4% paraformaldehyde (10 min) and then permeabilized with 0.1% PBS-Tween for 20 min. The cells were then incubated in 1x PBS / 10% normal goat serum / 0.3M glycine to block non-specific protein-protein interactions followed by the antibody (ab40763, 1/1000 dilution) for 30 min at 22°C. The secondary antibody Goat anti-rabbit IgG H&L (Alexa Fluor® 594) (ab150080) was used at 1/4000 dilution for 30 min at 22°C. 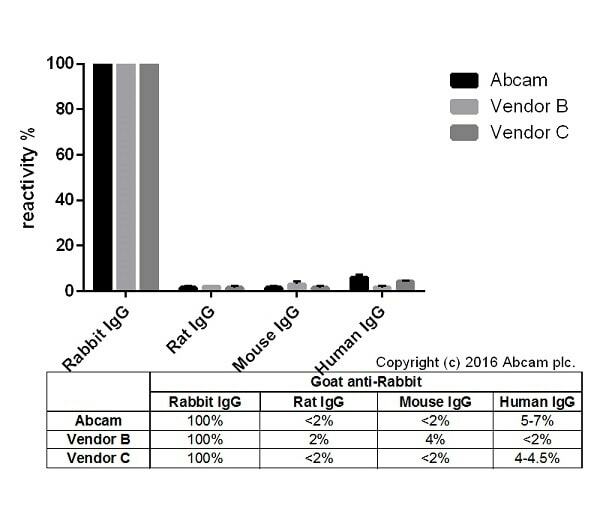 Isotype control antibody (black line) was rabbit IgG (monclonal) (ab172730, 0.1μg/1x106 cells) used under the same conditions. Unlabelled sample (blue line) was also used as a control. Acquisition of >5,000 events were collected using a 561nm laser and 610/20 bandpass filter. Immunohistochemistry (Formalin/PFA-fixed paraffin-embedded sections) - Goat Anti-Rabbit IgG H&L (Alexa Fluor® 594) (ab150080)This image is courtesy of an anonymous abreview. 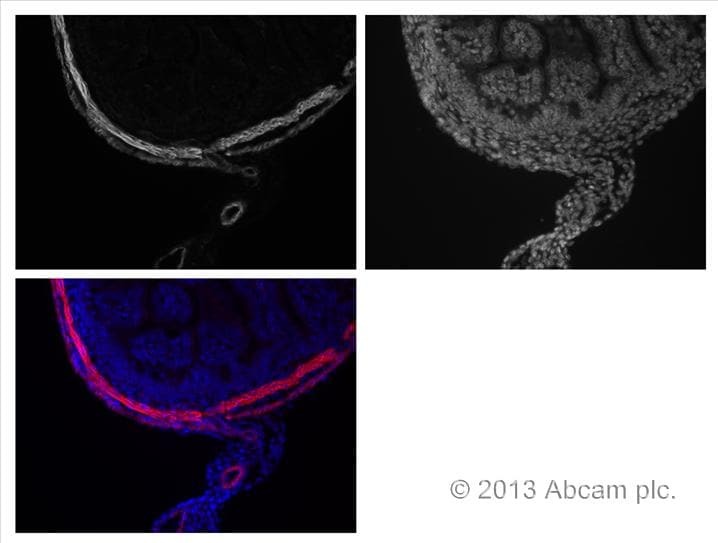 IHC-P image of alpha smooth muscle actin (ab5694) staining E16.5 mouse embryo gut. Paraformaldehyde fixed and paraffin embedded E16.5 mouse embryo gut sections were dewaxed and rehydrated before antigen retrieval (4 mins in a pressure cooker in 10mM Tris/0.4mM EDTA buffer pH 9.5). They were then incubated in 50mM NH4Cl for 30 minutes and washed/blocked in 3x 10 minute washes of PBS containing 1% BSA + 0.2% gelatine and 0.05% saponin. Sections were incubated overnight with a primary antibody against alpha smooth muscle actin (ab5694), diluted 1/250 in PBS containing 0.1% BSA and 0.3% triton. After 3 x 10 minute washes in of PBS containing 0.1% BSA, 0.2% gelatine and 0.05% saponin, the sections were incubated for 1 hr in the secondary antibody (ab150080, diluted 1/400, shown in red) and then the 3 washes repeated. Sections were mounted in Vectashield with DAPI (blue). Publishing research using ab150080? Please let us know so that we can cite the reference in this datasheet. Smooth muscle actin staining in the E16 mouse gut. Paraformaldehyde fixed and paraffin embedded E16.5 mouse embryo gut sections were dewaxed and rehydrated before antigen retrieval (4 mins in a pressure cooker in 10mM Tris/0.4mM EDTA buffer pH=9.5). They were then incubated in 50mM NH4Cl for 30 minutes and washed/blocked in 3x 10 minute washes of PBS containing 1% BSA + 0.2% gelatine and 0.05% saponin. Sections were incubated overnight in primary antibody against alpha smooth muscle actin (ab5694), diluted 1/250 in PBS containing 0.1% BSA and 0.3% triton. After 3 x 10 minute washes in of PBS containing 0.1% BSA, 0.2% gelatine and 0.05% saponin, the sections were incubated for 1 hr in the secondary antibody (ab150080, diluted 1/400) and then the 3 washes repeated. Sections were mounted in Vectashield with DAPI. Images are Alexa594, Dapi and the merge.